On the Thursday before Labor Day, a federal judge in Texas ruled that the Overtime Final Rule issued by the Obama Administration is invalid because the U.S. Department of Labor exceeded its authority in doubling the salary-level test (from $455/week to $913/week) that would have eliminated exempt status to executive, administrative, and professional employees without regard to their job duties. The Overtime Final Rule would have reclassified four million workers and made them eligible for overtime pay. Last November, the same judge issued a nationwide injunction blocking implementation of the overtime rule. The court’s decision in State of Nevada v. U.S. Department of Labor was expected and is what the current Labor Department had sought in amended court pleadings this spring – a ruling that the Obama Overtime Final Rule (and the salary level threshold of $913/week) is invalid, but that the Department does have the power to set a salary threshold at some level. Nonprofits Have a Big Stake in Overtime-Rules Debate, Jennifer Chandler and David L. Thompson, Chronicle of Philanthropy (paywall), September 1, 2017, explaining why it is in nonprofits’ best interest to submit comments to the U.S. Department of Labor on the overtime RFI. Labor Department Reopens White-Collar Salary Exemption for Comments, National Council of Nonprofits, August 2017, providing background on current law and annotations that explain several of the questions presented in the RFI. SBA Conference Call on Overtime and Regulatory Reform, Tuesday, Sept. 12, 3:00-4:00 pm ET, providing nonprofits an opportunity to learn more about the RFI, raise questions, and learn more about regulatory reform efforts. See the sidebar and Register now! Approve an initial Hurricane Harvey aid package. Plus, Republican leaders want to pass a budget resolution for the next fiscal year that, in addition to setting spending levels for the year, would authorize a budget reconciliation bill that would allow them to pass an overhaul of the federal tax system without the challenge of a filibuster in the Senate. The path forward remains unclear and most options face strong opposition. Treasury Secretary Mnuchin proposed that Congress combine a $7.85 billion Harvey relief package with raising the debt ceiling, only to face unified opposition from conservatives wings of House Republicans insisting on spending cuts. Democrats have said they will oppose any spending bill that includes funding for construction of a U.S.-Mexico wall and last month the President promised to shutdown the government in order to get that funding. He may have backed off that threat and Congress is expected to pass a temporary spending bill, known as a continuing resolution or “CR,” that will fund the government into December, which will give Congress time to try to work out many of their differences. Congress also returns to find the attempts to politicize charitable nonprofits and foundations are as hotly opposed as when it left. Notably, an expanded number of signatures on the Community Letter in Support of Nonpartisanship greets lawmakers on their return, a letter now signed by more than 5,500 charitable nonprofits, houses of worship, foundations, and others. 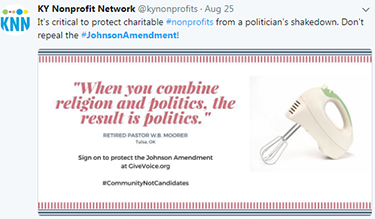 Currently, four bills are pending in Congress that would repeal or weaken the Johnson Amendment, the decades-old law that protects 501(c)(3) organizations against demands from politicians and their operatives for political endorsements and campaign contributions. One of those measures is an extraneous rider to the mammoth appropriations bill that is likely to be voted on in the House this week. Last month, the Justice Department submitted a brief in Freedom From Religion Foundation v. Trump, defending President Trump’s Executive Order on the Johnson Amendment while raising questions about the substance of the Order. The government admitted, “The text of the Executive Order itself does not purport to exempt religious organizations from the political campaign activity provisions of § 501(c)(3), nor does it privilege religious organizations over secular organizations. Rather, section 2 of the Order merely directs the Government not to take adverse action against religious organizations that it would not take against other organizations in the enforcement of the § 501(c)(3) restrictions.” The Justice Department’s brief appears to contradict the President’s Rose Garden signing ceremony statement: “You’re now in a position to say what you want to say.” Parties seeking to politicize charitable nonprofits, houses of worship, and foundations are likely to see the Justice Department acknowledgement as a reason to increase pressure on Congress to change the Johnson Amendment. Politicking on Children’s Health: The Children’s Health Insurance Program (CHIP) is set to expire on September 30, and there is talk of turning the legislation to renew the largely bi-partisan program that provides health coverage for eight million children in low-income families into a “Christmas tree” bill that attracts other provisions (ornaments) as the price of votes needed for passage. One idea is to include language repealing Affordable Care Act (ACA) taxes – such as levies on some health insurance plans and medical devices. Others are hoping to use the CHIP bill as a vehicle for extending payments to insurers to reduce the cost of some insurance plans under the ACA. Either provision may become so controversial that it delays action on the CHIP bill, thus allowing the program to lapse. The Senate Finance Committee is expected to hold a hearing on the program in mid-September to consider options. Trying to Get to Yes on Healthcare: The leaders of the Senate Health, Education, Labor and Pensions (HELP) Committee have scheduled four hearings in the next two weeks seeking consensus on legislation to stabilize insurance markets under the Affordable Care Act. The timing is important because insurers must decide in the near future whether to participate in the ACA markets in 2018. Committee Chairman Alexander (R-TN) said he hopes to have a narrow, bi-partisan bill introduced by the third week of September that would lower out-of-pocket costs and give states more flexibility to meet some requirements of the ACA. Witnesses at the first HELP Committee hearing will include Governors Kasich (R-OH) and Hickenlooper (D-CO), who have released their own proposal for fixing the ACA, including exempting some insurers from the tax and creating a temporary pool of money to stabilize the markets. Are Nonprofits Seeing the Benefits of Grants Reforms? Late in 2014, the federal Office of Management and Budget (OMB) issued its Uniform Guidance which merged several OMB grant circulars into a single set of regulations in an effort to create a government-wide system of grants management. Notably, the grants reforms provided that nonprofits are entitled to be reimbursed by local, state, and federal governments for some or all of their indirect costs when federal money is in the funding stream. The Uniform Guidance also promised to reduce the administrative burdens for nonprofits, state and local governments, and others. Two and a half years later the big question is, Is it working? If your nonprofit has government grants and/or contracts, please take a few minutes to complete the Nonprofit Uniform Guidance Implementation Survey. Your individual responses will be kept confidential, but the aggregated results will help inform advocacy efforts on your behalf. The Taxpayer’s Bill of Rights, commonly referred to as TABOR, has been a part of the Colorado state constitution for 25 years. To supporters, the provision is a check on government spending and supposedly requires lawmakers to receive permission from voters before raising taxes or issuing debt. To opponents, TABOR limits lawmakers’ options in dealing with emerging challenges while also leading lawmakers to use creative financing schemes to avoid going to voters to generate revenue, such as imposing fees on nonprofits and others. According to the Pew Charitable Trusts, Colorado ranks third among the states for imposing “service charges” that cover everything from parks to textbooks to hospitals. Colorado is currently the only state to have enacted the public policy, but North Carolina and Arizona have considered adopting the revenue restriction in recent years. Reflecting debates in jurisdictions across the country, Nebraska is facing the question of whether tax incentives spur economic growth or result in net losses of state revenues as legislators push business tax breaks as part of the State’s economic development strategy. Shortly after Toyota and Mazda announced Nebraska as a potential location for a 4,000-employee auto assembly plant, two legislators offered a package of tax incentives. A Nebraska Department of Revenue analysis, however, indicates that such incentives result in a net drain on the State, losing $295 million in revenues due to credits, refunds, and incentives last year. The analysis found the proposed new incentives would result in a net loss of $50.7 million this year, and $81.8 million by 2025. The lawmakers argue that the analysis fails to account for economic growth and intangibles such as a higher quality of life due to better wages. New nationwide accounting rules require states and localities to disclose revenue loss due to tax holidays and incentives. Nonprofits repeatedly have turned to the new transparency to urge legislators and local officials to reevaluate the appropriateness of business giveaways before seeking to tax nonprofits or otherwise alter the government-nonprofit compact. California Contracting Hurdles: A troubling anti-contracting bill has been put on hold, but it could come back in the fall. Legislation in the California Assembly would require counties to impose additional paperwork and other review burdens when opting to outsource public services, including when contracting with nonprofits. A Nonprofit Letter opposing the legislation, signed by more than 300 organizations, demonstrated the collective impact of the nonprofit community and nonprofit advocacy. Illinois Notice Requirement: Illinois recently enacted the Social Services Contract Notice Act for non-governmental service providers that deliver social services on behalf of the State through grants, contracts, or agreements with state agencies. The law requires a written 30-day notice before the government can terminate a contract that is not canceled for cause. This means that the typical practice of simply ending contracts effective immediately with no notice due to funding cuts is no longer an acceptable practice in Illinois. North Carolina Red Tape Review: A bill signed by the Governor authorizes the Joint Legislative Program Evaluation Division to study the red tape that nonprofits experience when providing public services through government grants and contracts. The study is supposed to recommend solutions to address these challenges as well as the chronic underpayment of nonprofits’ indirect costs by state agencies. The legislation has been a high priority for the North Carolina Center for Nonprofits. Last year, millions of Americans didn’t vote because they missed a registration deadline or didn’t know how to register. The reasons for missing the deadline are many: some are not aware that they must register to vote before they can cast a ballot; life changes such as turning 18, changing your name, moving, etc., require a voter registration update. The National Voter Registration Day for 2017 will be held on Tuesday, September 26. 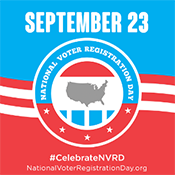 Americans can register at hundreds of events across the nation and online at www.NationalVoterRegistrationDay.org. Supporters can also follow National Voter Registration Day activities through social media on September 26 by searching #NationalVoterRegistrationDay. 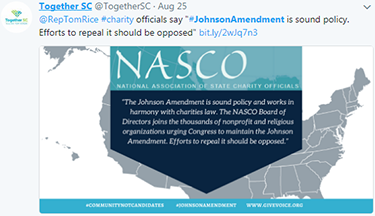 On August 25, dozens of nonprofits came together to advocate for protection of the Johnson Amendment as part of a push for “No Riders” on federal appropriations bills – and they didn’t even have to leave the comfort of their offices. In the span of one hour, hundreds of tweets were directed to key House and Senate offices expressing the importance of nonprofit nonpartisanship and sharing comments from signers of the updated Community Letter in Support of Nonpartisanship. While such “hashtag activism” is no substitute for letters, phone calls, and meetings with elected officials, it can be a great way to get an issue on the radar of offices on Capitol Hill or in state capitals. 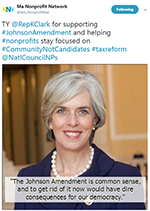 Another great strategy is to use social media to thank elected officials for their support, just as the Massachusetts Nonprofit Network did in the tweet to the right. But this story of advocacy in action isn’t just a look back at recent efforts – it’s a preview of things to come. On September 25, we invite you to join nonprofits from across the country in celebrating #MissionMonday. We hope you will join nonprofit colleagues throughout the country in sharing the impact of your nonprofit’s mission and how it would be affected by the infiltration of partisan politics if the Johnson Amendment were to be weakened or repealed. 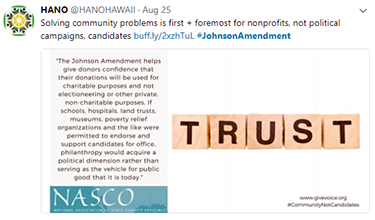 Stay tuned for more details in the next issue of Nonprofit Advocacy Matters and feel free to follow us at @NatlCouncilNPs and @buildnpcapacity and continue to use the #JohnsonAmendment and #CommunityNotCandidates in the weeks leading up to #MissionMonday. The federal government is reconsidering regulations on overtime and other subjects and is seeking nonprofit input to help ensure new rules and regulations consider the way charitable organizations operate and advance their missions. Join this conference call hosted by the Advocacy Office of the U.S. Small Business Administration. Register now! "We're proposing for families a code so fair and simple, nine out of 10 will be able to file their taxes using a simple postcard-style system." - Rep. Kevin Brady (R-TX), Chairman of the House Ways & Means Committee, quoted in “Brady talks tax reform in Kingwood,” San Antonio Express-News, August 23, 2017, providing a driving goal of federal tax reform this fall – one that could significantly reduce the tax incentive for charitable giving unless other changes are made. - The Rev. Martin Luther King, Jr., quoted in “Evangelicals squander their moral authority by sticking with Trump,” by Jonathan Merritt, a senior columnist for Religious News Service, in USA Today, August 24, 2017. Blueprint for Stronger Health Insurance Markets, August 30, 2017, letter to congressional leaders from a bipartisan group of eight governors led by Gov. Kasich (R-OH) and Hickenlooper (D-CO) three reforms to stabilize insurance markets, preserve coverage gains and cost controls under the Affordable Care Act, and engage the states in developing solutions to outstanding problems with the healthcare law. The number of cities among the 100 largest cities by population holding elections in 2017. This includes elections for 36 mayoral contests, 31 municipal officers other than mayor, 367 city council seats, and 50 special district officials. Elections range from the Anchorage City Council to the Miami Mayoral race, and from the Boston Mayor and City Council races to those in Los Angeles. Source: Ballotpedia, Municipal Elections 2017.